Specialists in all aspects of office and house removals Nottingham. Established in 2003, we are a family run and experienced company. We pride ourselves on our highly reputable and competitively priced service to all of our customers. At Near & Far, we understand that moving house can be rather daunting. Our aim is to provide you with as much support and assistance as you require, ensuring the move to your new home runs as smoothly as possible. We carry out both small and large removals Nottingham in an efficient, thoroughly planned manner. Unlike other companies, your move will be the only job our dedicated team will carry out that day. Moving house is a stressful time in itself, and sometimes just sourcing a reputable removals company that can take care of everything at an affordable price can seem like and laborious task. 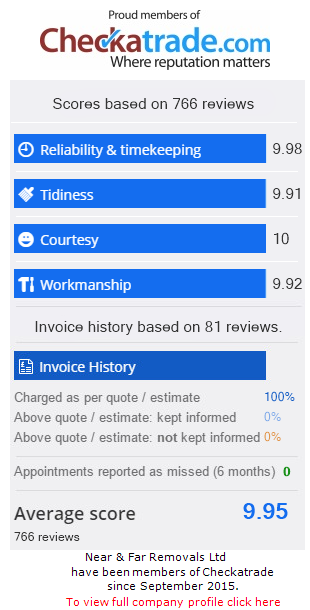 You can trust us: our quality service and reputation is second to none. 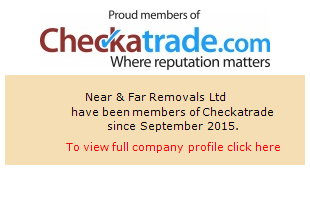 Near & Far are a family run removal company in Nottingham. Based in Ruddington, we have built a great reputation across the Nottinghamshire area for offering a high standard of home and office moving. We understand that everyone’s requirements are different, which is why we tailor our service to meet the individual needs of our customers. Managed by husband and wife team Martyn and Elaine, Near & Far have been helping to move businesses and home owners across the East Midlands and the rest of the UK for over 16 years. A dedicated service, attention to detail and precision and planning ensure that you moving house is left in the very best of hands. Whether you are looking for removals in Nottingham or UK wide the Near & Far Removals team will take care of you. Hi Elaine We just wanted to say a massive thank you to Josh, Rob and Mark. They were awesome, friendly, proactive, responsive and made what could have been a very stressful day, a great day. We'll be in touch when we're ready to move onto the next one and if we're able to have the same 3 for our next move we'd be really grateful. Many Thanks James. I want to say a big thank you to near and far. Especially Chris, Josh and Jordan for helping us move yesterday. They worked tirelessly without a real break to get us in. No job too big or small. Polite, considerate and professional. Lovely guys. Near and far will be highly recommended by us. They turned the experience from stressful to special. Thank you. Thank you very much for a fantastic service. The men were very quick and efficient and it made the experience of moving, if not entirely stress free, much more manageable. Very helpful, polite. Nothing too much trouble and explained everything as they went. The lads have been amazing and worked so hard. Absolute superstars! They have been professional, good fun, worked tirelessly and made our move go smoothly. Excellent Team, fantastic workers. Would recommend to anyone wishing to move. I just wanted to say thank you so much for the excellent service you provided for us. The guys were so professional, quick and helpful. I would not hesitate to recommend Near & Far in the future. Fantastic. Really great service. Nothing was too much trouble, really impressed. I'd definitely use you again if we ever move in future. Thank you! Excellent, thank you. Very helpful service and everything went well- very nice crew, recommended to friends already. Absolutely brilliant!! They have taken all the stress out of moving and been extremely helpful. Thank you. The best removal company i have ever used. Fantastic service, super friendly & extremely professional. Absolutely WONDERFUL company ~ the team were A class, swift, efficient, lovely, the BEST. The team were efficient, careful, thoughful & very pleasant to deal with. Smoothly accomplished and careful. Would recommend and use for future removals. Friendly, efficient service from quotation to final box delivered. Removals crew were courteous and careful. Brilliant service which i highly recommend. Excellent - Moving day went so smoothly. Perfect! Quick and efficient. Couldn't have gone any better, will use again! Extremely friendly and helpful. Would recommend Andy & Chris were fantastic, great job. Great set of lads, very polite & efficient. Second removal with Near & Far, excellent service. Andy, Aaron & Mark were brilliant and made it easier for me. Very Friendly, Professional & Careful with the packing. Brilliant Men. Really fantastic. Very friendly, efficient & professional. Would highly recommend! I just wanted to say thank you to your employees for a really good job. We have used you now on several occasions and hopefully we will be engaging you again to move our possessions out of storage and back into our home when the builders have finished. We would be happy to recommend you to any family or friends who may be moving. Very efficient service and friendly, helpful guys highly recommend! Very good, helpful and friendly. Excellent service, helpful and efficient team. We are delighted with your service - a really easy move for us. Excellent service and positive attitude. Very friendly service. Made moving a breeze. Thank you, I commend your guys for their efficiency and friendliness. Our love went very smoothly. All very professional. I would recommend to my colleagues and friends. Great service. Polite, courteous guys - would highly recommend. Prompt and efficient service, made moving house so much easier ! It was a filthy day and rained all day. The men were cheerful, efficient and very helpful and wasted no time at all. Company very helpful and accommodating. Guys arrived when they said they would, loaded unloaded put everything where we wanted it. I would definitely recommend them, the score is 10 out of 10. I have moved many times and this company is the best. Thank you. The initial survey was carried out 4 months before moving date was confirmed and initial contact was kept to a minimum with no hard push for contract commitment until a moving date had been confirmed. A moving date was confirmed at short notice and Near and Far Removals& Storage stepped up to the mark with advice and details and final pricing. The move was extremely well managed with a great team who worked to a high standard and had great humor and dedication to all tasks and challenges of moving large heavy and awkward items. Thoroughly recommended as a friendly and professional removal company in Notts. Near and Far's staff were extremely helpful, cheerful and above all professional in their handling of my move and i could not recommend them highly enough. They were a pleasure to have around at what could have been a very stressful time. I found the experience of moving pretty painless - you took the stress out of it all! The guys moving me were very efficient and friendly, and I could not have asked for a better service: in short, excellent! Many thanks! Excellent service, second time i have used Near & Far and can thoroughly recommend. Absolutely excellent, THANK YOU !! Excellent - Took all the stress out of moving. Were all friendly and helpful. Even moved my ridiculously heavy bed! Superb guys, Great Job, Highly recommended. Efficient, professional and great company. An excellent experience a lovely team of lads! Thank you for all your help. Brilliant guys will recommend. So helpful and charming. Great move, would recommend your services. Thank you for making our move painless. Fantastic efficient and helpful. Very pleasant team to be around hard working, thorough - made a stressful couple of days as easy as possible. Wonderful! Thank you. Excellent service from start to finish, very friendly staff. Great move both worked very hard in the most horrible weather. Many thanks Robert. The boys were amazing, efficient and swift. Really friendly service. Prompt arrival. Efficient removal of goods. Polite and courteous. Really efficient service, very helpful staff. All our items moved and packed safely. Took alot of stress out of such a big move. Thank you to everyone at Near & Far. The Team on the day were very efficient and professional and made our move run smoother than we ever expected. Brilliant, Thank you for your help! Very swift and caring. Highly recommended. Friendly efficient service, will use again! Our move went really well, the guys were great, so helpful and talked us through what they were doing. They made a stressful day much easier. Very helpful, courteous, punctual staff. Clean vehicles and corporate presentation. A big thank you! Brilliant guys, very professional and friendly. Would highly recommend. Near and Far provided us with an exceptional service. They made our move seem easy and they couldn't have been more fantastic! Thanks guys - made a difficult day a pleasure. Men worked excellent - very friendly and polite, did a brilliant job in very humid temperatures. The two lads were extremely helpful and certainly made the day go smoothly. So thank you very much for making a potentially stressful day, an enjoyable one! Efficient and very hardworking! Thank you all so much. Highly recommended, especially bob, martyn and marc. Very polite, friendly and efficient. Everything went as they told us and as was planned. Thanks! Fantastic service from start to finish we would highly recommend. Really nice and helpful guys. Thanks a lot !! A good job, well done. Impressive service, thank you ! Excellent Service, Fast working and friendly. Not only was the service excellent the "lads" were great too - They made the day enjoyable and we had a real laugh with them! Thanks for a pleasant experience. Thank you for making my move as hassle free as possible. Everyone from Near and Far have been unfailingly pleasant, helpful and efficient. Absolutely brilliant, friendly, smiley and very helpful. Highly recommended! Staff were friendly, helpful and effective in their job. Very happy. We moved in a hurry on December 12th 2014 and despite the last minute booking received a competitive quote and an excellent service. Our three storey house was cleared in less than four hours and we were in our new house (an hours drive away) by 5pm. No breakages either. Hire this company with confidence as we were very happy with their service. Further to our move on January 23rd January we'd like to communicate our total satisfaction with the service from the removal team who moved us. We found the team to be knowledgeable, genuinely caring and reassuring and above all professional removal men. From the wise old sage with the knowledge to the strength of another and the agility of a young buck, this well-chosen team delivered a service beyond the price we paid and we would have no hesitation in recommending the firm to family and friends. It was a bonus to discover the owner was a Magpie! I have used Near & Far twice now and would not go elsewhere. They are very friendly and efficient and most of all careful. They certainly are extremely good value for money and I would not hesitate to recommend them.